When stepfamily life gets tough, remaining dedicated to your commitment is a day-to-day decision. Ron L. Deal, director of FamilyLife Blended and one of the nation's leading experts on Christian stepfamilies, gives couples keys to building a healthy stepfamily. The eight sessions--ideal for small groups or seminars--offer useable solutions for everyday living, practical tips for raising stepkids, and ways to strengthen the couple's marriage. Deal's personable presentation combines instruction and encouragement that affirms both husbands and wives and their intent to build strong families. The video presentation supports Deal's popular book The Smart Stepfamily. Along with the DVDs, a Participant is available here. Remarried couples and stepfamilies comprise approximately one-third of American homes, yet rarely do churches have a specific ministry for these families. Traditional marriage and family educational resources prove inadequate to help prevent divorce and strengthen stepfamily homes. But ministry specifically designed for stepfamilies is helping couples beat the odds and break the cycle of divorce while helping churches become relevant to this growing population of families in their community. 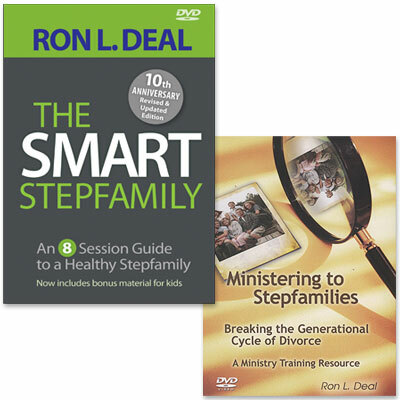 Ron L. Deal is Director of Blended Family Ministries at FamilyLife and President of SmartStepfamilies.com. He is a family ministry consultant and conducts marriage and family seminars around the country; he specializes in marriage and stepfamily enrichment. Ron is author of the bestselling book and DVD curriculum The Smart Stepfamily and author/coauthor of The Smart Stepmom, The Smart Stepdad, and The Remarriage Checkup. He has extensive experience training pastors, ministry leaders, and counselors and has appeared on dozens of national radio and TV broadcasts in the US, Canada, and the UK. Ron is considered a leading voice in stepfamily education and ministry and in the prevention of redivorce. He and his wife, Nan, have been married since 1986 and have three boys. For more information visit RonDeal.org.